I suppose by Las Vegas standards this is pretty tame, but in New Orleans, the lights attracted a good deal of attention. My wife and I rode the streetcar towards the waterfront and noticed this colorful structure. It’s located on Canal Street near a bunch of tall and modern hotels. While obviously trying hard, the river front area with the hotels, shopping malls and casino, just doesn’t have the character and attraction of the nearby French Quarter. It’s not just the modern structures, the size and density doesn’t seem right. Unlike the Quarter, with its tiny streets and smaller human scaled buildings, the more recent attempts at redevelopment come off as being impersonal. At least that’s the way I felt walking in this area. For all of its glitz, there doesn’t appear to by much substance. Granted, we were there on a Monday, which is probably one of the slower nights. Yet, venture a few blocks north-east and the old section of town is filled with tourists. 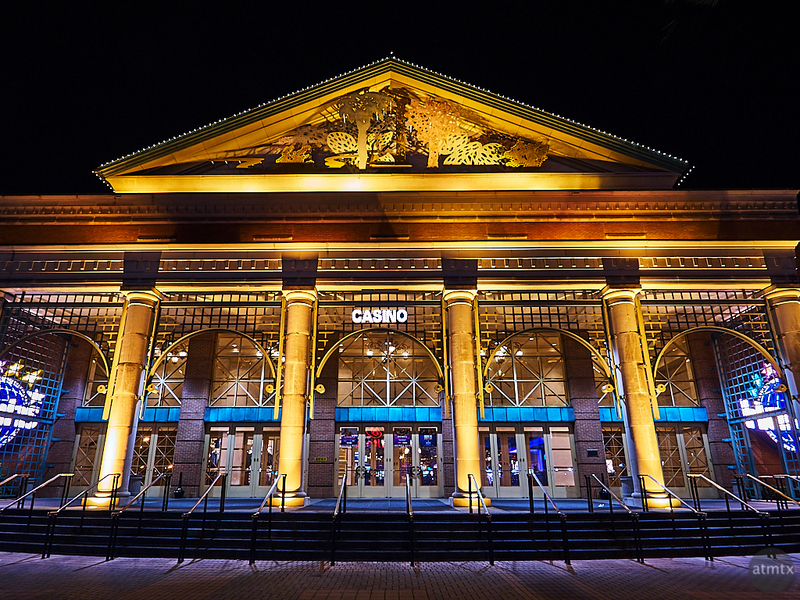 At least I was able to capture this “Temple of Gambling”, in wide-angle, with my usual Olympus setup. That building looks like a bank in drag, not a casino. who designed it I wonder?